Wired just published a in-depth piece on how Darpa is "weaponizing" the Oculus Rift for cyberwar. But does this mean that soldiers are about to start firing at each other in virtual reality? No, of course not. But it's an interesting development for a piece of technology dreamt up for games (in which you often shoot people). What Darpa's really doing with this latest Oculus experiment is what Darpa always does. The research agency is doing research into an exciting new piece of technology, namely, an awesome new display that stands to change the way we think about user interface. Like Oculus's new parent company Facebook, the military as a whole is seeing how this transformative technology will change the world. In fact, the Navy is already using Oculus Rift for training, and at least in the near term, the cyber war use case would also involve training. 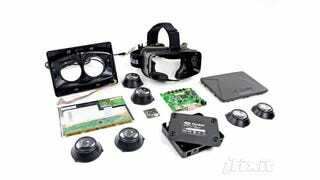 On Wednesday, Oculus Rift was on display at Darpa's Demo Day in the courtyard of the Pentagon. The interface that Darpa's built is part of Plan X, a cryptically named software platform to unify the military's cyberwar capabilities. This is not a finished project. In fact, Darpa's Plan X program manager Frank Pound told Wired that it was simply a "notional" proof-of-concept created by a couple of design firms (a.k.a. not Darpa). There are no immediate plans to start strapping Oculus Rifts to soldiers heads. But there is a plan for a plan. It'll be quite some time before you have control rooms of G.I. Hackers bobbing their Oculus-enabled heads and mauling malware. Are they in the process of "weaponizing" this tech? They're certainly toying with the idea.